As 2017 comes to a close, we are on the verge of setting another worldwide temperature record. From January through November 2017 global surface temperatures (land and ocean) averaged 0.84°C (1.51°F) above the 20th century average, according to the NOAA State of the Climate report. This also means means that 2017 is currently the 3rd warmest year on record, globally, for the 137-year period of record (1880-2017). This graph shows how global temperatures relate to the 20th-century average month-by-month for the 8 warmest years on record (colored lines) plus 2017 (black line). 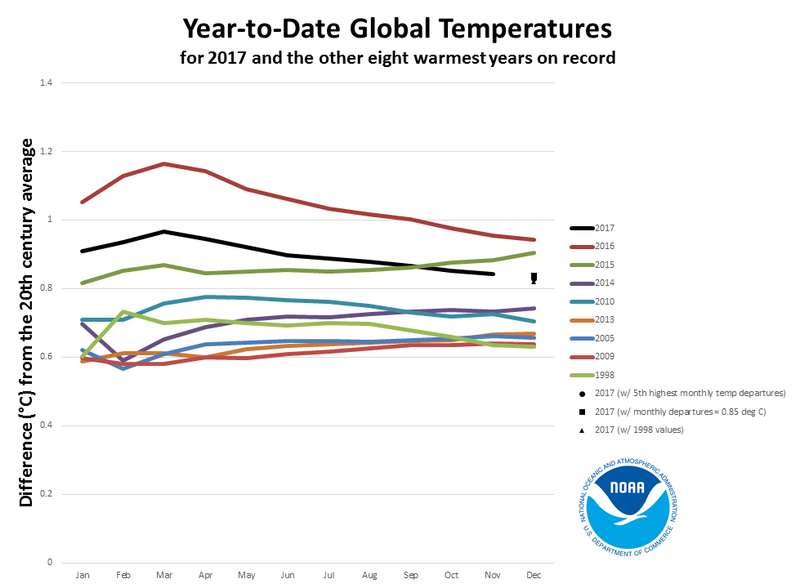 You can see that, during much of the year, 2017 was in the running to be the second-warmest year on record. By October, however, temperatures had cooled just enough that 2017 fell into 3rd place, owing in part to the dwindling effects of the El Nino pattern that ended in 2016. At this point the die has been cast and, no matter what happens in December, this year will almost certainly end up as the 3rd warmest on record. The 3 warmest years on record have all occurred consecutively -- 2016 is #1, 2015 is #2, and now 2017 is #3. What's more, 5 of the 10 hottest years in the U.S. have come since 2006. Locally, the story was a bit different in 2017. A cloudy, rainy May held temperatures down across the state of Minnesota, resulting in the first below-average monthly temperature at MSP Airport in 21 consecutive months. Another below-average month occurred in August (it was a pleasant State Fair, remember?!). And, what of our recent cold snap? Believe it or not, through December 27th, temperatures at MSP were still running 2.0°F above average. If temperatures for the rest of the month are exactly as forecast, though, the month could end about 0.3°F below average. Even with a colder-than-average finish to 2017, the year as a whole will still be more than 2.0°F above the 30-year climate average in MSP.